I recently hosted my dear sister Kristin’s Bridal Shower. Of course, the Bridesmaids and I planned a gluten-free and corn-free Bridal Shower, in order for the hostess to also partake in yummy Tea Party foods. On the menu, Gluten-Free Tea Sandwiches (made with Rice Flour bread), Berry Trifle (made with Betty Crocker’s Gluten-Free Cake Mix), Gluten-Free Mini Berry Tartlets, Curried Chicken Salad, and Strawberry Spinach Salad. Nobody even noticed that the cake and mini-tarts were Gluten-Free, but of course I could not hesitate to share this info with all the guests! What better way to celebrate summer than with a delicious scoop (or three) of Ici Ice Cream. This was our first trip to Ici after hearing raving reviews and boy,… we were not disappointed. With unique flavors such as pluot-raspberry and rosemary-candied-bacon, the long line outside went fairly quickly while we tried to choose from such interesting flavors. I was determined that rosemary-candied-bacon was going to be beyond my palette range, but it was just perfect! The salty bacon matched the sweet cream and the rosemary flavor was not at all overpowering. The overall flavor was reminiscent butter-pecan. Sorbets for the lactose-intolerant and gluten-free cones as well! I love that all ingredients are natural, local, and organic when possible. I haven’t attempted homemade pasta in awhile; my first attempt resulted in so-so results (hard texture/chewy results). Our friend Chef Brigitte (currently on Cooking Channel) was home for a visit and I asked if she wouldn’t mind lending her culinary skills to helping me make homemade gluten-free ravioli. Here are some shots from our fun cooking session; Chef S eagerly willing to help out. 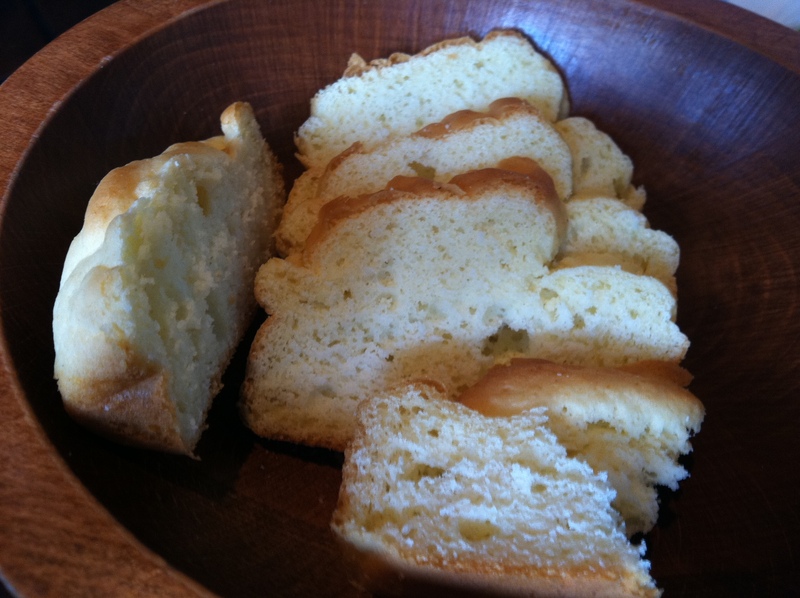 We used a premixed Gluten-Free French Bread mix for the dough; you can use your favorite GF bread or dough recipe. We stuffed with a variety of ingredients (I went a little crazy at the market: fresh herbs, roasted butternut squash, pecorino, manchego, & mizithra cheeses, and italian sausage). Brigitte added a lot more liquid & egg to the dough to ensure a nice soft, doughy texture. Final product before cooking them up! I relish over the few months I lived abroad in Florence, Italy, during my undergrad days. There truly is nothing like real, homemade Italian pasta. Since going gluten-free, I’ve been searching for a gluten-free pasta that has that perfect texture, as an Italian-made pasta. Thanks to Rustichella pasta, those that partake in gluten-free dining can enjoy the wonderful consistency and taste of Italian made pasta (made from corn or rice), without the gluten! Perfect with fresh herbs, your favorite sauce, or a little pancetta, olive oil and garlic, this pasta will not disappoint. Can be found at Market Hall in Oakland, CA or online. Gluten-free dining is getting more and more press and exposure these days, which I love, because it not only increases awareness in the public eye, but within the restaurant industry, making it all the more easier for gluten-free folks like ourselves to safely eat gluten-free when dining out. (Yay!) An article on tastingtable.com focuses on the growing number of delicious gluten-free friendly Italian restaurants in San Francisco. Check them out and let me know your favorites! Grilled cheese AND gluten-free?! Just like Mac-N-Cheese and gluten-free, these words aren’t usually found together, but the American Grilled Cheese Kitchen is all that it is hyped up to be. Awesome location in San Francisco’s South Park neighborhood; near Jeremy’s (grilled cheese + shopping, can’t go wrong) and the Ballpark. I ordered a classic: “Piglet:” Tillamook sharp cheddar, artisan cured ham, apple mustard, rosemary butter. The gluten-free bread was amazing. AMAZING. And they make the bread there; it isn’t ported in from some other bakery or mass manufactured. I love that they cut the bread super thick like Texas Toast, before grilling it to perfection (with the cheese grilled into crispy bits on the outside). It was the end of a busy Sunday when we stopped in, so they were starting to close up. I can’t wait to come back again soon and try all the other sandwiches! PS. I didn’t get to try, but they offer Gluten-Free Mac-N-Cheese as well?! Our Mac and Cheese girls night out (+ 2 toddlers) was a complete success. We snagged one of the last tables (without having a long wait) promptly at 6 pm on a Tuesday night. An array of cheesy (and one vegan) choices and of course, the long-awaited gluten free pasta (well worth the +$1.50). My fellow GF friend loved her Bard’s Sorghum Beer; I tried the fresh tangy limeade, and some of the ladies went with the wine pairings with their mac and cheeses: chevre and sharp goat cheddar vs. pecorino and peppercorn. Wine pairings with mac and cheese? How much more delicious can it get. Wonderful time was had by all; I plan to return many, many times to try the other versions. Great service too! (and the chalkboard access for little kiddies is a huge plus). We would think Vodka is distilled from potatoes, but there are actually very few vodkas these days that are potato-based. Don’t listen to your bartender, because I’ve had several whom said that only top shelf vodkas such as Belvedere and Grey Goose was potato-based, but they where clearly wrong. We’ll just give them credit for their clever mixology skills over their distillation knowledge. 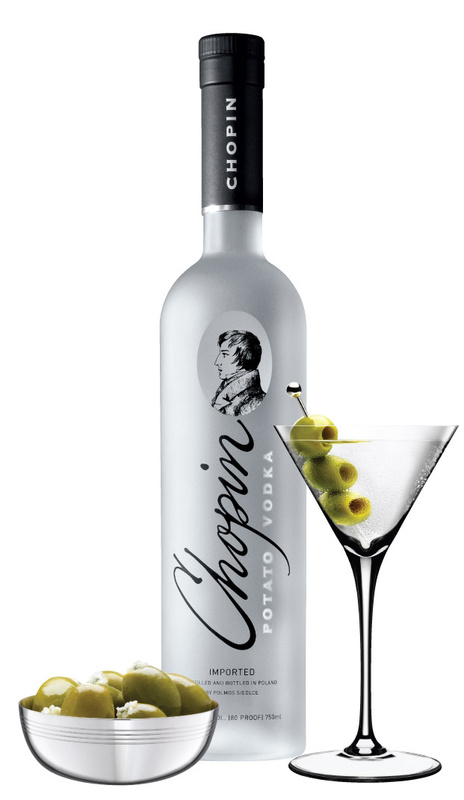 Check out Chopin Vodka – available at your local BevMo. It’ll be in the $30-40 range, but keeping that bottle tucked in the freezer will bring delight to your cocktail hour. San Francisco’s Bacco restaurant, tucked in family-friendly Noe Valley, is like stepping into a classic Italian ristorante. I love that they serve my favorite brand of gluten-free pasta made in Italy; so the craftsmanship, taste, and texture of the pasta is second to none, especially for the gluten-free variety. 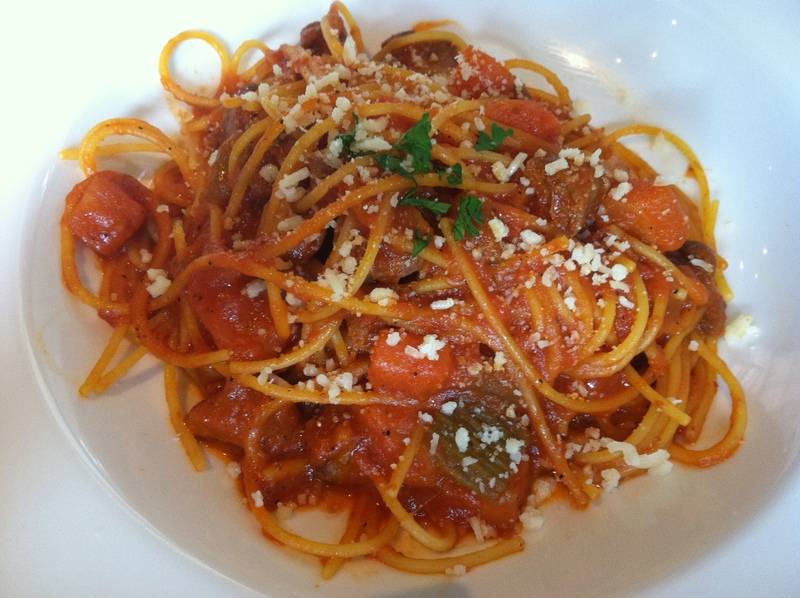 The Spaghetti with lamb ragu did not disappoint, nor did the homemade Gluten-Free bread! Excellent service and delicious, authentic Italian. Viva Bacco!